Round 1: ch 12, sl st into first ch to form a ring. Round 2: ch 1, work 18 sc into ring, sl st in first sc to join. So, so pretty! Love it! That is so beautiful!!! I can't wait to try it...definitely putting it on my "Craft Itinerary" board on Pinterest. So beautiful!!! 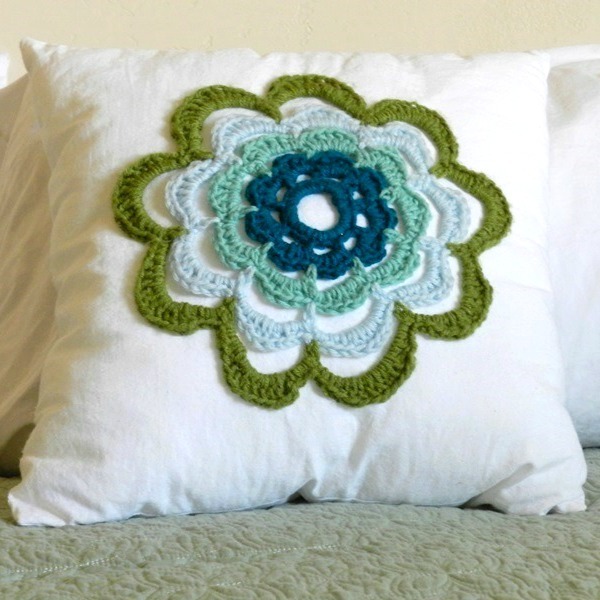 Love the crocheted rosette and their colors! Ooh I love this! So pretty! Thanks so much for the pattern! Gorgeous! I am in love with the to colors you picked! This is so pretty! I've been on the hunt for great pillows, but can't ever find much I like in my price range. I love this idea, and can't wait to try one out. Thanks so much for sharing. Have a wonderful day! Pinned! Such a cute pillow. Thanks for sharing the pattern. Beautiful! Do you think it would work in an afghan? Great blog! I like every your tutorial, and i LOVE the ones with abstract art with watercolors (and the watercolor portrait too)!